This is a daily activity in Pamukkale and there will be chance to see the Ancient city of Hierapolis and Calcium Terrace on the sky . You will be picked up from your hotel and taken to the Dinamit Tepe where we will jump. First you will be introduced to our tandem pilots. 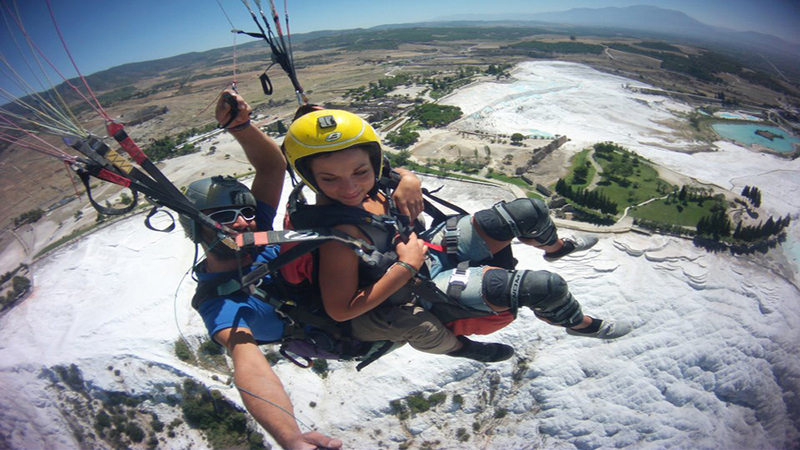 Pamukkale Paragliding experts will drive you to take of point and show you preparation of paraglide. When you are ready to jump you will be set with the tandem pilot and then make the first step for an memorable flight above Pamukkale Calcium Teraces and Hierapolis Ancient City. The Paragliding above Pamukkale start from your hotel and drop off your hotel, preparation and landing are take approximately 1 hours. We will be glad to provide you an unforgetable experience and enjoy with safe and reasonable price condition. Please fill our form below and we will contact you shortly.